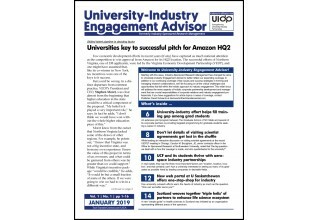 ATLANTA, January 16, 2019	(Newswire.com) - Starting with the January 2019 issue, Industry-Sponsored Research Management has changed its name to University-Industry Engagement Advisor to better reflect its expanding coverage, according to David Schwartz, publisher and CEO of Atlanta-based 2Market Information Inc. In addition to continuing coverage of key issues and success strategies in forming and managing research collaborations, the repositioned publication will focus on all the critical challenges and opportunities that fall within the holistic approach to industry engagement. This wider focus will address the many aspects of corporate partnership development and management that are crucial responsibilities of corporate relations and industry engagement professionals in universities worldwide. 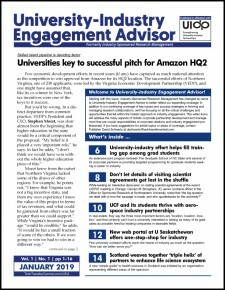 A growing number of universities that are integrating their industry engagement efforts and creating a single entry point for corporations are finding great success and bringing in new dollars, new resources, and more strategic partnerships with companies that have greater impact and touch multiple areas of the university. 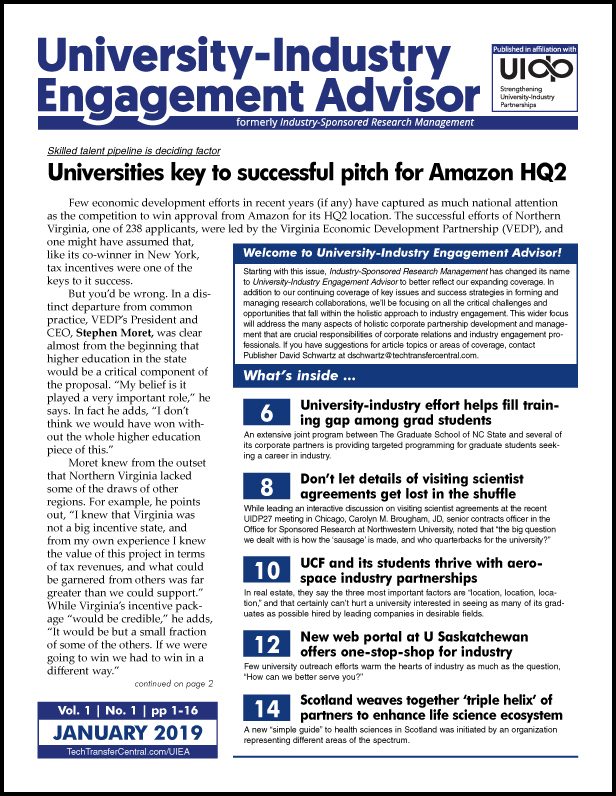 Coverage in the publication will continue to be informed by the partnership between publisher 2Market Information and UIDP, the leading national membership group devoted to helping universities and corporations strengthen their collaborations. The group is comprised of both leading research universities and industry members. All UIDP members receive University-Industry Engagement Advisor as a membership benefit. 2Market Information is also the company behind Technology Transfer Tactics – the leading publication for university tech transfer professionals -- and Tech Transfer Central (www.techtransfercentral.com), a web portal offering hundreds of distance learning programs and other professional development resources for those involved in research commercialization. The premiere January issue is now available, and for a limited time, the company is offering a $100 discount on the annual subscription price. For complete details, go to https://techtransfercentral.com/marketplace/university-industry-engagement-advisor/subscribe. 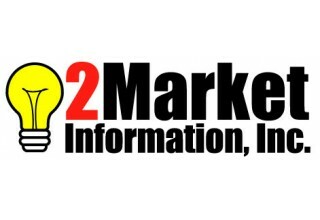 2Market Information Inc. is the leading independent information provider for tech transfer and research commercialization professionals worldwide. PR Person, 2Market Information Inc.